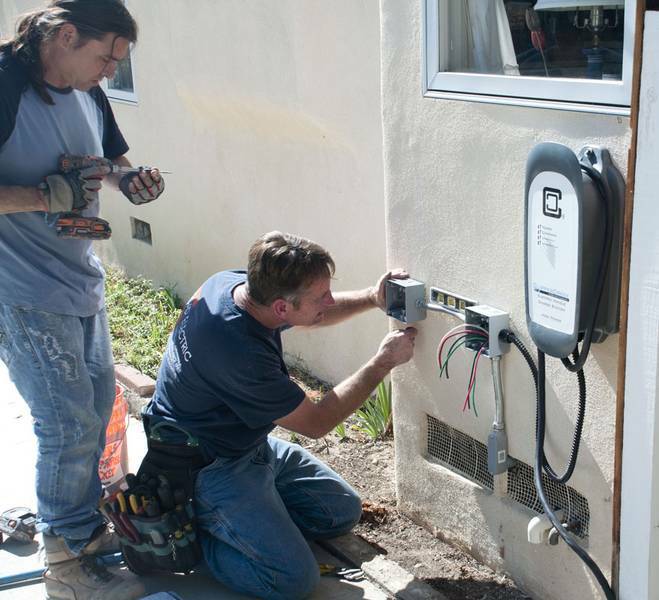 How much should you pay to install an EV charging station in your home? Get national averages, cost influencing factors, and free quotes from local pros. Use our simple two step process to tell us about the Green Energy job and what is required and well try and connect you with Green Energy companies suitable to your needs. Your contact details and privacy will be treated with the utmost discretion and privacy. Our aim is for you to be connected with the tradesperson that is 100 % suitable to your needs and circumstances. 100% FREE No Obligation Service, Saves You Time and Money. Our Tradesmen Network are Pre-Screened & Certified. How Much Does an EV Charging Station Installation Cost? As the effects of global warming become more profound, more and more people are being considerate of how they drive or power their home. The effort to go green has been the very inception of different innovations. The most notable solution in the modern day life is the rapid adoption of electric-powered or hybrid cars. If you are someone like this, an EV charging station installation would be inevitable. How Much Will It Cost To Install an Ev Charging Station? Most EV drivers agree that an average of ￡460 is enough to install a capable EV charging station. The cost to install an EV charging station could, however, be anything between ￡150 and ￡1,050 depending on its quality and charging capacity. The cost varies depending on a couple of factors that will either determine how safe, convenient or efficient the charging station would be. The things to consider when choosing your EV charging station installation include: Where you will park your car How fast you want to charge your EV The number of EVs to charge at a go Your safety concerns hence the safety features on the EV charging station installation EV Charging Station Installation � Important Features Even though the bulk of the bill will go into purchasing the EV equipment, you should also be wary of any permits or changes you may need for the house to accommodate the EV charging station installation. Some homeowners might need permits for any major changes to the electrical circuitry. A professional installer will be able to handle all of this for you. Amperage Output The amperage determines how much charge you can put into your EVs batteries per hour. Generally, most electronic vehicles will give you a specific range per hour depending on the amperage you use on the charge. Running 30 amps an hour will earn you 30 miles. A 15 amp charging station will give you 15 miles for the same time. The higher the rating the better. Most EV charging station installations will have protection to ensure that your car only draws as much current as it can handle. No need to worry. The Location And Charging Cable Length When doing the EV charging station installation, always think of where you will park your car for the night. You want your station to be close to your car. 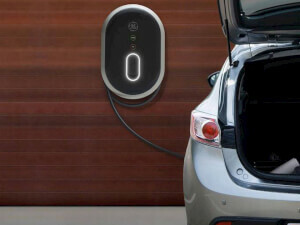 Moreover, you will need a longer cord to extend your charging capabilities to the driveway or let you plug in another car without necessarily driving it into the garage. Connectivity If you are the tech-savvy type, you might want an EV charging station installation that lets you monitor and control charging remotely. You will spend more on a Wi-Fi enabled EV charging station but will at least have control over what happens to your car throughout the night. Other Cost Determinants You might have to purchase a new circuit breaker box and run a different heavy-duty system to your EV charging station installation point. Taking a couple of quotes from different contractors will ensure that you get the right installation rates for your region. It will help you choose the best contractor for the job. Get Your Free Estimate Are you interested in an accurate cost to install an EV charging station, tailored to your specific area? Simply enter your zip code in the space provided on this page. 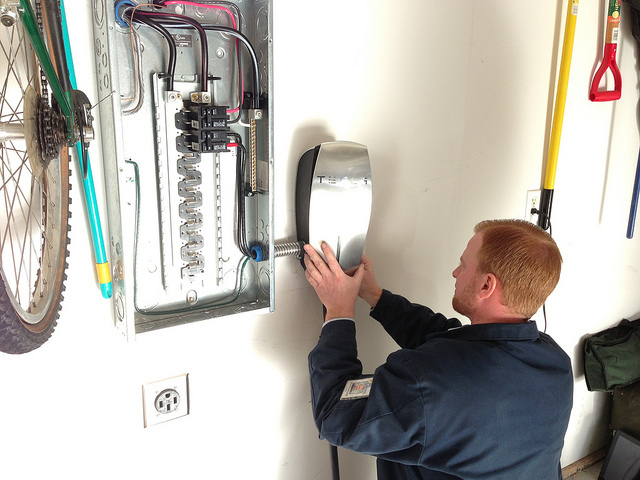 You will receive a 100% FREE EV charging station installation estimate from local contractors near you. And remember, you are under no obligation to pay or sign any contracts whatsoever, so you have absolutely nothing to lose by taking advantage of this free offer. "Easy enough process to follow and tradesmen got in touch.Just wanted to say thanks to the team for trying their utmost to find a suitable tradesmen. I Liked that i was not bombarded with calls" - Dirk Rust from Chelmsford". Tradesmen found in the area. Simply fill out your details to connect with tradesmen! By clicking below, you authorise Green Energy companies we recommended to call you to discuss your project. You understand that some may use automated phone technology and that you are in no way required to purchase any products or services from them. It's entirely your choice choice.